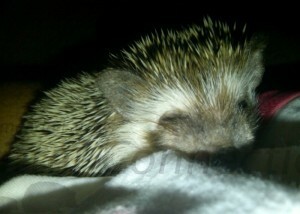 Information » Activity Levels » Are Hedgehogs Nocturnal, Crepuscular, or Diurnal? Some hedgehogs may exhibit crepuscular activity, meaning they are active in early morning and early evening, but hedgehogs are considered to be primarily nocturnal. No matter how the hedgehog is technically defined or described, each is going to have its own schedule of activities or routine. 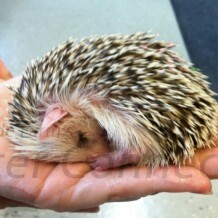 Many hedgehog experts and enthusiasts agree that hedgehog senses are adapted to work best at night. Whether naturally active at night only or at dawn and dusk, the point is that hedgehogs are active when the levels of light are very low or even pitch black. Hedgehog activity typically is not determined by the hour of the day, but rather by the level of light. Hedgehogs have very poor eyesight so their other senses are sharper to compensate for this weakness. Generally speaking, the world is much more calm and quiet during the night. Hedgehogs are naturally timid and afraid of new things, such as strange smells or sounds. Human noise, movement, and distraction lessen at night, which makes it more comfortable for pet hedgehogs. One of the simplest ways to observe hedgehog activity is to use a red or black night-light. These types of light will allow human observation but night creatures cannot see them. Some people believe that a hedgehog is a perfect pet for them because they themselves are awake at night. Keep in mind that a hedgehog’s activity is more closely related to light rather than to the time of day. Unless you are awake in the dark or low light, you might be surprised by how much your hedgehog will sleep at night and that you may not see nighttime activity. Hedgehogs need daylight to maintain their circadian rhythms so please do NOT keep them in a dark room, closet, or some place without a day and night cycle. Read more on this topic at the bottom of this article. For more information on this topic check out our Activity Levels article. In animal behavior, diurnality indicates an animal that is active during the daytime and rests during the night. Animals that are not diurnal are either nocturnal (active at night) or crepuscular (active primarily during twilight, i.e., at dusk and dawn) (“Diurnality”, n.d.) Many animal species are diurnal, including many mammals, insects and birds. The diurnal pattern is often controlled internally by the circadian rhythm (endogenous rhythm) of the animal. In some animals, especially insects, external patterns of the environment control the activity (exogenous rhythms) (“Diurnality, n.d.). Some animals, mainly nocturnal or crepuscular ones, have been domesticated as pets and have changed into diurnal animals to coincide with the cycle of human life. Examples include pet dogs and cats, which are derived from the wolf and the wild cat. However, these animals may exhibit their species’ original behavior when they are born feral. The word crepuscular is derived from the Latin crepusculum, meaning “twilight”. Its sense accordingly differs from diurnal and nocturnal behavior, which respectively peak during hours of daylight and dark. The distinction is not absolute however, because crepuscular animals may also be active on a bright moonlit night or on a dull day. The use of the terms often is vague; for example, some animals that are casually described as nocturnal are in fact crepuscular. ^ “Crepuscular Summary”. BookRags.com. 2010-11-02. Retrieved 2011-07-11. Twilight is the time before sunrise or after sunset when sunlight scattered in the upper atmosphere illuminates the lower atmosphere, and the surface of the Earth is between light and dark. Often confused with dusk (the darker stage before or after twilight when it is dark enough to need a light to see ), twilight is specifically defined as the period either side of nighttime during which it is possible to conduct outdoor activities without the aid of artificial light. The collateral adjective of “twilight” is crepuscular (for daylight it is “diurnal” and for night, “nocturnal”). The term is most frequently encountered when applied to certain species of insects and mammals that are most active during that time (“Twilight”, n.d.). As an animal behavior, nocturnality describes sleeping during the daytime and being active at night – the opposite of the diurnal human lifestyle and that of those animals with which we are most familiar. The intermediate crepuscular schedule (twilight activity) is also common. Some species are active both during the day and night. Living at night can be seen as a form of niche differentiation, where a species’ niche is partitioned not by resources but by time itself, i.e. temporal division of the ecological niche. It can also be viewed as a form of crypsis, in other words an adaptation to avoid or enhance predation. There are other reasons for nocturnality as well, such as keeping out of the heat of the day. This is especially true in deserts, where many animals’ nocturnal behavior prevents them from losing precious water during the hot, dry daytime. This is an adaptation that enhances osmoregulation. Many species which are otherwise diurnal exhibit some nocturnal behaviour; for example, many seabirds and sea turtles attend breeding sites or colonies nocturnally to reduce the risk of predation (to themselves or their offspring) but are otherwise diurnal. Some animals are not really nocturnal and are instead crepuscular, being mostly active in twilight. Nocturnal animals generally have highly developed senses of hearing and smell, and specially adapted eyesight. Circadian rhythms are important in determining the sleeping and feeding patterns of all animals, including human beings. There are clear patterns of core body temperature, brain wave activity, hormone production, cell regeneration and other biological activities linked to this daily cycle. In addition, photoperiodism, the physiological reaction of organisms to the length of day or night, is vital to both plants and animals, and the circadian system plays a role in the measurement and interpretation of daylength. Timely prediction of seasonal periods of weather conditions, food availability or predator activity is crucial for survival of many species. The rhythm is linked to the light-dark cycle. Animals kept in total darkness for extended periods eventually function with a freerunning rhythm. Each “day,” their sleep cycle is pushed back or forward, depending on whether the endogenous period is shorter or longer than 24 hours. The environmental cues that each day reset the rhythms are called Zeitgebers (from the German, Time Givers). It is interesting to note that totally-blind subterranean mammals (e.g., blind mole rat Spalax sp.) are able to maintain their endogenous clock in absence of the external stimuli. Freerunning organisms that normally have one consolidated sleep episode will still have it when in an environment shielded from external cues, but the rhythm is, of course, not entrained to the 24-hour light/dark cycle in nature. Some say that sleep/wake may, in these circumstances, become out of phase with other circadian or ultradian rhythms such as temperature and digestion. This research has influenced the design of spacecraft environments, as systems that mimic the light/dark cycle have been found to be highly beneficial to astronauts (“Circadian Rhythm”, n.d.). The morning songs of birds, the foraging behavior of the squirrels in autumn, and the human tendency to get a little blue in the winter all represent the natural rhythms of life. The presence of internal biological clocks, or circadian rhythms, is one of the most universal traits shared by all living things, from bacteria to fruit flies to humans. Dr. Shelley Tischkau, a researcher at the University of Illinois College of Veterinary Medicine, explains, “Since the beginning of time on earth, these rhythms have been controlled by one consistent, essential force: the light/dark cycle” (Labak, 2005). Circadian rhythms dictate the daily and seasonal timing of many behaviors, and are most heavily influenced by exposure to light, be it natural sunlight or artificial light from lamps. This simple fact can pose a problem for pet owners who own nocturnal pets and pets whose breeding behavior is influenced by the light-dark cycle. Fortunately, pet owners can alter their animals’ exposure to light or change the timing of other influencing factors (such as feeding and playtime) to help their pets adjust to living in the human world. According to Dr. Tischkau, “birds, mammals, and reptiles have a biological clock located in the hypothalamus, a part of the brain that controls basic biological functions such as respiratory rate, heart rate, and reproduction” (Labak, 2005). Light is sensed by the eyes and the pineal gland in birds, located in the top of the head, and this sensory input is sent to the biological clock. The clock communicates to other centers in the brain, indicating the time of day and time of year. Animals need to know when it’s day or night so they can fill their niche in nature. Rodents, for example, have a strong sense of smell and forage for food at night; they also serve as food for nocturnal owls and felines. Animals that rely heavily on vision to find food and communicate, such as songbirds, are typically active during the day. Some animals, such as squirrels, are most active at dawn and dusk. As presence of light signals day from night, day length indicates what season is approaching, so animals know when to migrate or hibernate. Animals also use their internal clocks to time their courting and mating. This ensures that their young are born during a season when weather is mild and food is plentiful, maximizing the chance for survival. So what does this internal biological clock mean to the pet owner? In general, animals are much more reliant on their biological clocks than humans are, and if you own a nocturnal pet like a hamster, rat, or cat, your pet may be running around at night when you’re trying to sleep, or napping during the day when you want to spend quality time with them. An animal’s response to light can be overridden and its circadian rhythms altered if the timing of essential activities is altered. For example, Dr. Tischkau makes sure her kittens have playtime in the early evening so that they are tired out by late night, and she feeds them at night so they don’t bother her at 5 a.m. for food. This timing may not work the same for all pets, but Dr. Tischkau affirms that feeding and playtimes can have a huge impact on biological clocks (Labak, 2005).